Sugar Hill: lucy is turning one! a gift guide! lucy is turning one! a gift guide! i truly can't believe lucy is going to be a year old in a few weeks, or that we are celebrating another first birthday for that matter! we are so excited to celebrate her life, she is such a joy + truly brings delight to our souls daily... we couldn't be without her! as we gear up for her birthday + also gift giving season right around the corner, we are seriously simplifying around here + being extra choosy with what we keep in our home. i think it's important to do so as our family grows, as we prepare to move into our new space, and just as a general rule! 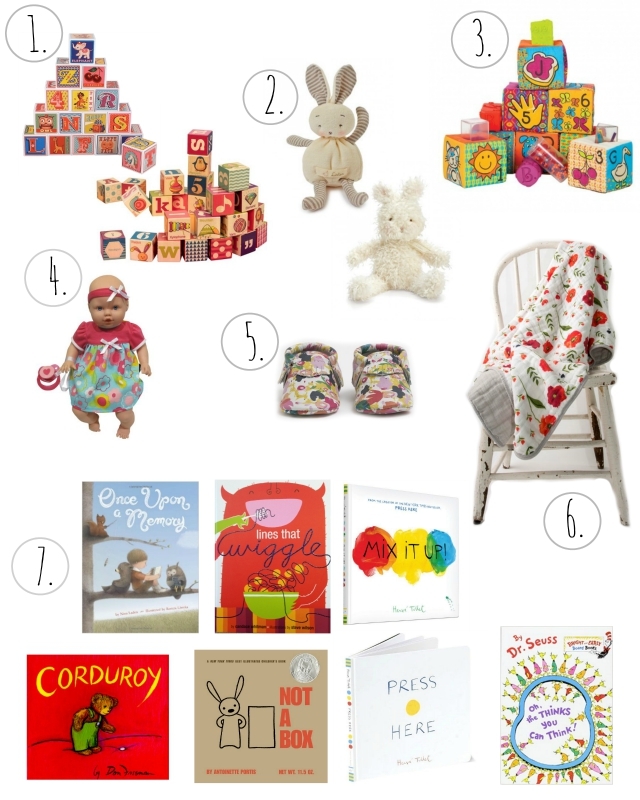 for her birthday i put together a little gift guide as to what we think she would enjoy! 1. blocks on blocks on blocks... i mean can you have too many blocks? abel thinks not. tall towers to the sky! i LOVE these retro, wooden blocks (my sister has a set from Clothes Pony here in town.) these HERE are similar too, and we love that brand of toys! 2. these lovies are so soft + sweet. lucy "gives love" to all the the little stuffed animals she comes across, sooo precious. these can be found HERE, or at Clothes Pony here in town! 7. books, books, and more books! books are another thing i believe you can't have too many of EVER. i've seen book guides on a lot of blogs along the way + these are a few that look so fun to me! they can all be found on amazon!